Way back in 2005, during my very first trip to China, I lived in the town of Jinan. The school had given us all a map of the city that had points of interest marked on it, like the zoo, the public square, historical and cultural sites of interest, touristy stuff. I took a lot of cues from this map for weekend adventures, and among the activities presented was the Shandong Provincial Museum. Jinan, by the way, is the capitol of Shandong province, and is a small provincial town of 6 million people. This isn’t sarcasm. Six million isn’t enough to register as a city in a country where Beijing (20 million if you count the migrants) and Shanghai (14 million) are the big cities, 6 million isn’t enough for a blip. I only saw one skyscraper the whole time I was there, but moreover the attitude of the people was definitely more laid back and “small town” than it was in Beijing. Despite this, the museum is not called “provincial” for the small town feel of its home city, but rather because the larger bodies of land in China are Provinces (not States, Counties, or Prefectures, the Canadians in the audience get it). There were many astonishing things here, not the least of which was that none of the exhibits were climate controlled or protected from the public, however, in the natural history area, I found a peculiar taxidermied animal. 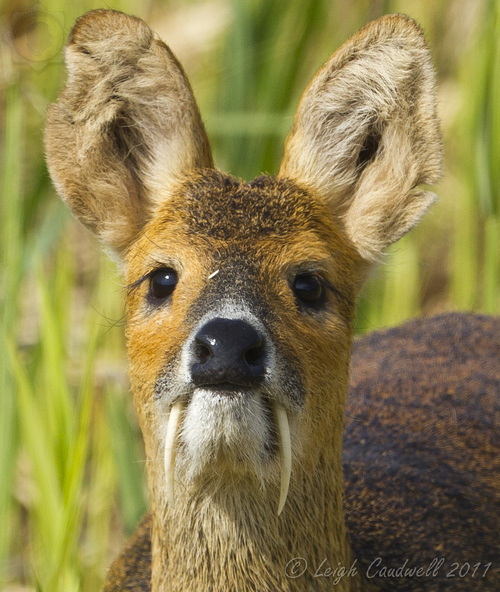 I read Chinese better now than I did in 2005, and I also have an electronic dictionary, which I did not have at the time, so I couldn’t read the plaque with this creature to get any kind of idea what I was looking at other than a saber-tooth deer, which seemed absurd. Sadly, this particular day, my camera decided to lose all my pictures, so everything from the museum and Thousand Buddha Mountain was lost forever, including the picture that I took of the strange animal for later investigation. For the last 9 years, I’ve just gone on being half (ok more than half) convinced that the Chinese just made this animal up in this backwater museum, because I’ve never encountered anything like it on line, or in nature documentaries, or even in any other Chinese museums. Then, while perusing facebook for random entertainment, I find a link to a story about strange animals which includes my saber-tooth deer! That’s right this animal is real. The males grow long canines which they use for defense and to show off by fighting in the mating season. Well played, mother nature. As I prepare for my journey to Saudi Arabia, I am confronted with the giant mountain of paperwork required to get the residency/employment visa. 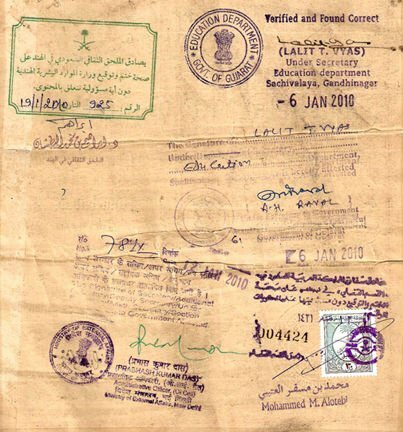 Understand that Saudi Arabia has been closed of to Westerners and/or non-Muslims for most of forever, and I understand that the government is interested in fostering tourism soon, however, to live and work with privileges of residency, one must still go through the gauntlet. If you care to, please see for yourself , but bear in mind that several of these steps are deceptive. Academic Verification, for example, is a whole other list which requires (among other things) official sealed transcripts, notarized copies of degrees, and a letter from the registrar verifying your attendance. I’m almost done with this, finally. Waiting on the mail man to bring me the transcripts and the last letter after a mere two weeks of ordering forms and frantic emails to the 3 educational institutions that have graced me with instruction. Once these are obtained, they must be sent to the Cultural Mission, where they will be further verified for another 2-4 weeks, and your approval will be mailed back in your pre-paid fed-ex envelope. The delay might be a good thing however, because I finally opened up the medical exam form that my doctor has to fill out in triplicate and have certified by the board of health or the college of physicians. At least I’ll have time to get all the lab work done and stamps collected while I’m waiting for my degrees to be verified. Oh, and lets not forget that Ramadan is in July this year, so right when I’ll be submitting this whole steaming pile of red tape, the embassy will be closed most of the day for a month. Its a snail race to see if I’ll get my visa before the August 22 start date of my employment offer. Ready, set, CRAWL! This whole thing is gonna be a little messy as I get my feet under me, but the basic plan is to share my adventures with you as I gallivant around the world, near and far. Sometimes, you’ll see a nice day hike only an hour away from my Home Base: Seattle, and sometimes you’ll see me in strange and exotic foreign lands. And if I get a chance, I’ll put up some of the old stories of adventures gone by. Wheeee!